Councilman Brian Bauerle accepts a grant check that reflects the total grant awards to all municipalities. Cherry Hill will receive $60,000 through the program. Cherry Hill has been awarded a $60,000 grant by the Delaware Valley Regional Planning Commission in recognition of efforts to promote transit-oriented projects in the Township, specifically for efforts to revitalize the area around the Woodcrest PATCO station. Township officials, including Councilman Brian Bauerle, were on hand to accept the grant award at a ceremony Thursday at the Walter Rand Transportation Center in Camden. The grant is among $1.8 million awarded to towns in the Greater Philadelphia area this year, and is intended to support local planning projects that will lead to more residential, employment, or retail opportunities; improve the character and quality of life within these communities to retain businesses and residents; enhance and use the existing transportation infrastructure capacity in these areas to reduce demands on the transportation network; and reduce congestion and improve the transportation system’s efficiency. Road work will continue next week on several local roads, including portions of Preston Road, Lantern Lane, Bala Road, Lenape Road, St. James Place, Evergreen Road and Hialeah Drive. All work is being done by the Township's Department of Engineering as part of the Township's 2015 and 2016 Road Maintenance Programs. Work on all roads will include road resurfacing, as well as isolated sidewalk and curb replacement where necessary. Trash pick-up will not be affected by this work; however, our contractor will notify residents in the event parking is limited by construction. All work is weather-permitting; residents with questions or concerns can contact the Department of Engineering at (856) 424-3203. My administration and Town Council continue to prudently invest in our town's infrastructure, and are continually working to ensure that our roads are smooth and safe for travel. Click here to learn more about our Road Maintenance Program. New Jersey American Water is expected to begin replacing the water mains and water service lines on Heartwood Drive, Lark Lane and Queen Anne Road on or around Monday, July 11. The majority of this work will take place in the roadway; however, some work will take place in the sidewalk or park strip. Construction will continue for approximately 10 weeks, with final paving and other restoration to follow in Fall 2016. Residents are advised that any area of their property impacted by this work will be restored to its original condition, and the street will be repaved. All work is weather-dependent. Click here for more information. Council members Sara Lipsett, Brian Bauerle, Melinda Kane, Jim Bannar and Carolyn Jacobs joined residents in Erlton South for the neighborhood's July 4 festivities. Council Vice President Sara Lipsett and Council members Jim Bannar, Brian Bauerle, Melinda Kane and Carolyn Jacobs celebrated Independence Day this year at the annual Erlton South July 4 parade and celebration, held on Thursday, June 30. The parade, hosted and sponsored by the Erlton South Civic Association, is a longtime community tradition, and one of the tight-knit neighborhood's largest celebrations of the year. We were proud to once again be a part of the event, alongside residents, the Cherry Hill Fire Department, swimmers from the Erlton Swim Club, representatives from Chick-Fil-A, young bicyclists donning their patriotic best, the Quaker City String Band, and others. It was a beautiful evening to celebrate our Nation's Independence. We're already looking forward to 2017! A heat advisory is in effect for our area through Saturday, July 9, and the the Cherry Hill Office of Emergency Management (OEM) has opened the Township's cooling centers during the day for those who need access to an air-conditioned facility. For after-hours questions or concerns about a potential heat-related emergency, please call the Cherry Hill Police Department at (856) 665-1200. To report a true medical emergency, call 9-1-1. Click here for tips and information to help you stay safe, cool and healthy during this excessive heat. 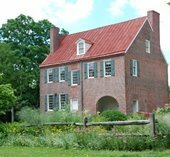 Barclay Farmstead will be open for public tours from noon to 4 p.m. Sunday, July 10. Historic Barclay Farmstead will open its doors from noon to 4 p.m. this Sunday, July 10, for this month's First Sunday Open House, as we continue a year of special festivities marking the farmstead's bicentennial! Enjoy guided tours, crafts, demonstrations and more, guided by the Friends of Barclay. This month's open house will focus on Farmstead chores, with hands-on demonstrations of 19th-century laundry and butter churning. All visitors should be sure to get their Barclay200 PastPort stamped, pick up a commemorative postcard, and register for our door prize! The Museum Shop will be open and accessible to the public to purchase special gifts. All ages are welcome; open houses are FREE for Cherry Hill residents, members of the Friends of Barclay, and children under 12. Admission is $5 for nonresident adults; $3 for nonresident seniors and students 13 and up. Can't make it this weekend? The farmhouse will be open for public tours the first Sunday of every month through November. Click here to learn all about Barclay, and for updated information about Barclay200 as we move through 2016. For more information, call (856) 795-6225, or e-mail info@barclayfarmstead.org. Be sure to follow @HistoricBarclay on Twitter and Barclay Farmstead Museum on Facebook for information on upcoming events and activities throughout the year. Hundreds of people turned out for the B Street Band at this week's Music Under the Stars at Barclay Farmstead. Thank you to all who came out for our first week of Music Under the Stars last Tuesday! We had a great crowd, and everyone loved the B Street Band's Springsteen Tribute. The Township's free, family-friendly summer concert series will continue this week with Beatlemania Again, and every Tuesday in July, with a different opening act and exciting headliner who's sure to keep you up and on your feet! Great food will be available for purchase. Bring your blanket, a chair, and even a picnic dinner - just don't forget your appetite for great music! Every Tuesday evening will feature a different musical adventure at the historic Farmstead. These concerts are FREE and open to the public! Make sure to tell your friends! Join Cherry Hill Recreation and Lourdes Health System for a free, four-week, Yoga in the Park series at Croft Farm, continuing this Saturday, July 9. This beginner-level class is open to all, and yoga is a wonderful activity for those with diabetes, high blood pressure, high cholesterol and heart disease, and helps everyone to build strength, flexibility and mind/body awareness. Classes will be held every Saturday in July from 8 - 9 a.m.. Please bring your own mat and water. For more information click here. Registration in advance is required. Get the kids ready and head on over to one of our local park on Fridays in July and August for a special outdoor Pop-up Story Time, brought to you by Cherry Hill Recreation and the Cherry Hill Public Library! More than 50 people turned out this Friday morning for our inaugural storytime, hosted at Ashland Park. The program will continue each week through Aug. 12, with stories and fun with CHPL’s Librarians. Story time runs from 10 to 10:30 a.m.; visit Barclay Farmstead on July 15; Cherry Valley on July 22; Erlton on July 29; Kresson Woods/Haddontowne on Aug. 5; and Old Orchard on Aug. 12, weather permitting. Click here for photos. For many of us, summer is vacation time, and no vacation would be complete without a great book! As it does every year, the Friends of the Cherry Hill Public Library will hold its July Book Sale from Thursday, July 14, through Saturday, July 16, at 1100 Kings Highway North. The Book Sale will begin with a special pre-sale for Friends members only, from 6 to 9 p.m. Wednesday, July 13. New Friends members are welcome to join the Library that evening. Public sale hours are 9:30 a.m. to 9 p.m. Thursday, July 14; 9:30 a.m. to 5 p.m. Friday, July 15; and 9:30 a.m. to 4 p.m. Saturday, July 16, for $5 Bag of Books Day. Thousands of books, CDs and DVDs will be offered; hardbacks, CDs and DVDs are $2, while paperback books are $1. All proceeds benefit the Library. 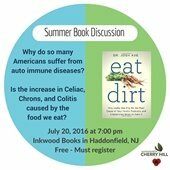 For more information, call (856) 667-0300 or go to www.chplnj.org. Join us as the Hunter's Heroes Foundation presents a donation of 25 fire service training books to the Cherry Hill Public Library. Kids will be able to meet a firefighter in gear and have the opportunity to climb aboard a fire truck! All members of the community are encouraged to attend to thank a firefighter for keeping our community safe. Free and open to the public. Philadelphia’s finest improv team will present a magical hour of adventure and interactive storytelling based on ideas and stories from kids in the audience! Best for kids ages 5 and up. Click here to register. Join us for an hour of sculpting Play-Doh. We provide the dough and the kids supply the imagination. Open to all ages! No registration. Cherry Hill is a great place to live, work and retire!